Published by R. L. Polk & Co. Publishers, 1934. Cover has some wear. Spine is cracked. Title page is wrinkled. Inside pages are nice and clean. One page is loose. 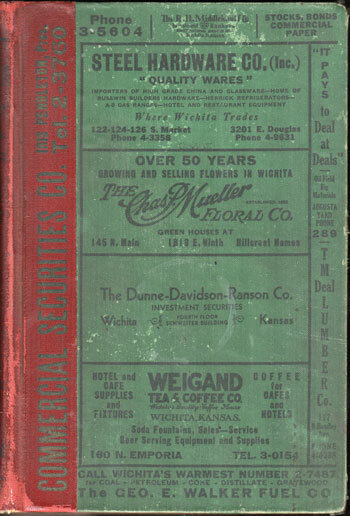 A directory of the residents of Wichita, Kansas in Sedgwick County, Kansas. Includes name, address, name of spouse and occupation. Also includes a street directory of residents. Hardbound, 778 pages. Also includes numerous business ads.